Ireland and England are favourites to reach the semi-finals of the Women's Rugby World Cup in Saturday's final round of pool games. A win over Kazakhstan would see Ireland top their group after inflicting a first World Cup defeat in 23 years on world champions New Zealand on Tuesday. England, beaten finalists at the last three tournaments, would also top their group with a win over Canada. Wales cannot progress having lost their opening two games in France. Ireland captain Fiona Coughlan is thrilled with the reaction to the win over New Zealand, but insists her team will not be complacent. "It's been amazing - the phone has just not stopped. We're on the front of the papers at home and it's just galvanised the country," she told BBC Sport. "But these tournaments are about consistency and playing every game for 80 minutes, so the next game is Kazakhstan for 80 minutes." 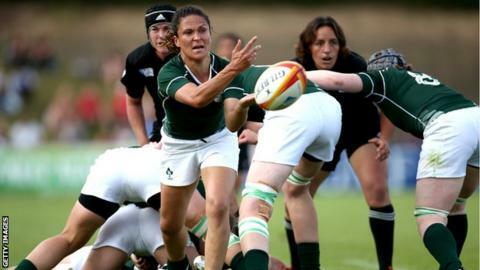 Ireland coach Philip Doyle will rotate his squad for the match after two "massively physical" pool matches against the USA and New Zealand, and there will be one enforced change, with number eight Heather O'Brien ruled out by a finger injury. Doyle told BBC Sport: "We have picked up a fair few bumps and bruises - undoubtedly I'll rotate the team. "We're good enough to win the World Cup. Of course, we need a little lady luck but we're not here to make up the numbers. "We have our own agenda, our own goals. First is to beat Kazakhstan, to make a semi-final. If we do that we'll re-address our goals." After convincing wins over Samoa and Spain, England will face tougher opposition in Canada, who beat them in the final of the Nations Cup last year, and are ranked sixth in the world. With both countries collecting two bonus-point wins to date, the loser could still potentially progress - with a losing bonus point - to the last four as the best runner-up, depending on results in the other pools. But given all the possible semi-final permutations, England full-back Danielle Waterman is focused on just one thing - beating Canada. "I think you can get very bogged down in all the ifs, buts and maybes," she said. "If we focus on beating Canada, that's all we can do as a team." Following the news that wing Lydia Thompson has been sent home with a groin injury, England head coach Gary Street has called on the services of 27-year-old Richmond wing Natasha Brennan. The Red Roses have lost to New Zealand in the last three World Cup finals and Waterman revealed that Ireland's victory over the Black Ferns had led to some excitement in the England training camp. "The score was being shouted from the team meeting room, to a couple of girls on the bikes, to the girls in the ice baths, to the girls in the pool," she said. "It was a really good game to watch and really exciting. It emphasises what we already knew - this tournament isn't just about New Zealand and England like it has been in the past." Losses to France and Australia in Pool C have already ended Wales' chances of reaching the semi-finals. France, with home advantage, are favourites to top their group and face Australia in their final match to decide who wins the pool. With only the best of the three runners-up joining the pool winners in the semi-finals, reigning world champions New Zealand are at risk of being knocked out. If Ireland win their final match against Kazakhstan, bonus points for the Black Ferns in winning their remaining fixture against the USA might not be enough to take them through, with any one of four countries potentially reaching a higher points total. Following the Irish defeat, New Zealand coach Brian Evans told BBC Sport: "We're still alive and we're going to keep going. "The bar's been rising for the last few years - Canada, France, obviously England and now the Irish, they're good teams - the standard is going up all the time." When asked if the USA should expect a Black Ferns backlash, Evans replied: "I hope so."